Believe it or not, when it comes to communication, WhatsApp is the most used platform by every age group. With all the amazing features WhatsApp is power packed with, one of the most used is WhatsApp Status. Using this feature, users can easily share pictures, gifs and videos with their contacts for a time period of 24 hours after which it automatically gets removed. This, however, can be a privacy issue for some users, as not everybody likes to share their personal pictures with everybody on their WhatsApp contact list. So, is there a way to hide WhatsApp status or to show WhatsApp status to selected contacts? 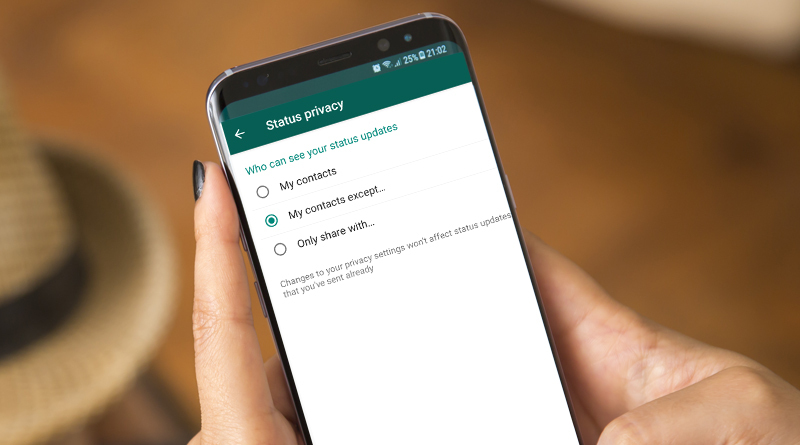 Yes, for this first you need to know how to hide WhatsApp status from some contacts and how to show WhatsApp status to selected contacts or to just one? Download Group Chat Lock For WhatsApp here. 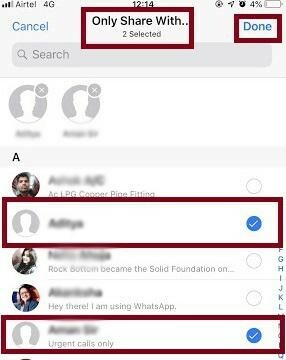 Hide WhatsApp Status from Specific Contacts on iPhone. 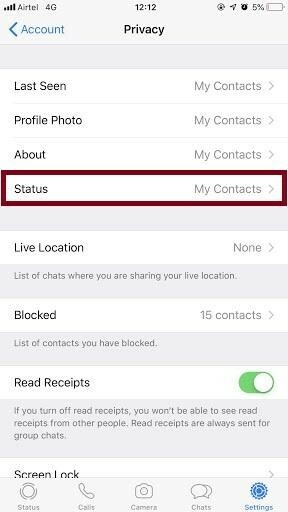 Show WhatsApp Status to Selected Contacts on iPhone. Hide WhatsApp Status from Some Contacts on Android Phone. 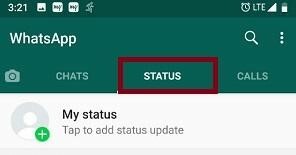 Show WhatsApp Status to Selected Contacts on Android Phone. 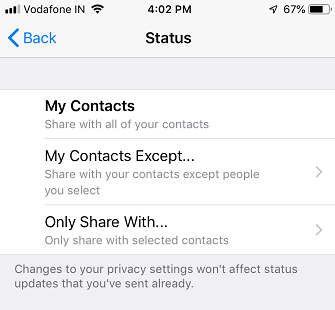 How to Hide WhatsApp Status from Specific Contacts on iPhone? Launch the latest version of WhatsApp on your iPhone. From the bottom right screen, tap on the Settings icon. From the Settings window, click on Account. 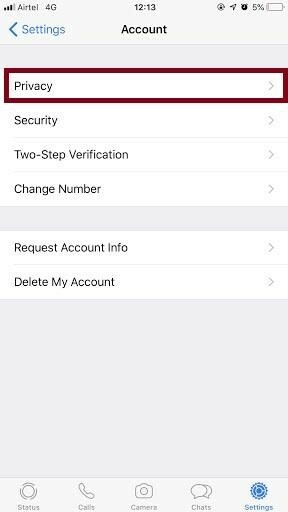 The account window shows an option named Privacy, tap that. The next screen that follows, tap on My Contacts Except…. Here, select the Contacts that you wish to hide WhatsApp status Updates from and then tap on Done. Once you have finished doing all the above-mentioned steps, your WhatsApp Status Updates will be hidden from selected Contacts. 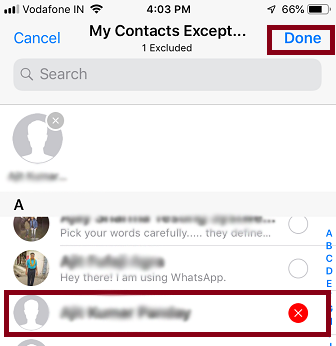 How To Show WhatsApp Status to Selected Contacts on iPhone? 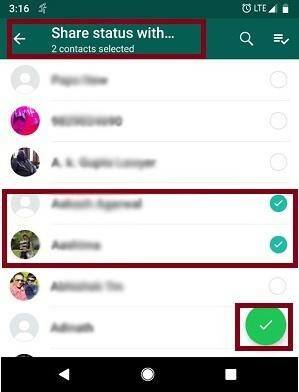 From the Contacts list, you can check the contacts with whom you wish to share the WhatsApp Status and then tap on Done. 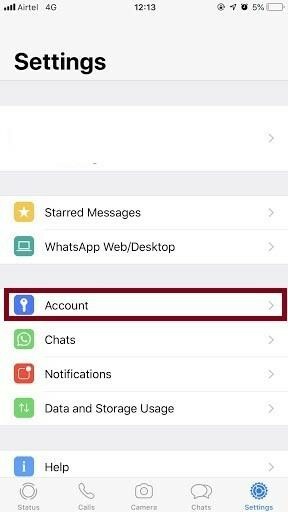 These were the simple steps following which users can shoe or hide WhatsApp status from their friends and families. The remaining article will describe the steps for Android phones. 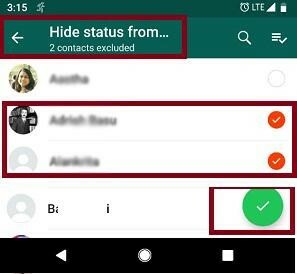 How To Hide WhatsApp Status From Some Contacts On Android Phone? Launch WhatsApp on your Android Phone. In the Status option window, click on the three vertical dots and select Settings from the drop-down menu. 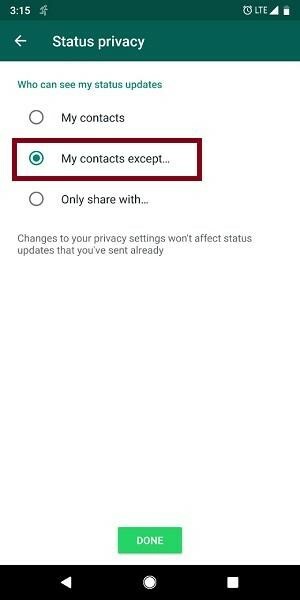 Here, select the Contacts that you wish to hide WhatsApp status from and then click on the green tick option from the bottom right corner. 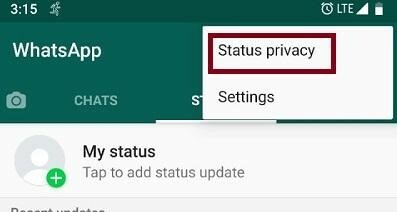 How To Show WhatsApp Status to Selected Contacts on Android Phone? The next screen that follows, tap on Only Share With…. Here, select the contacts that you wish to share WhatsApp status with then click on the green tick option from the bottom right corner. So, these are the simple steps any user can perform easily to show or hide WhatsApp status with specific people. This article adds some sort of security to the user’s privacy, however, there may be instances when users may want to add an extra layer of security to WhatsApp. For this, you can choose apps available on Play Store. But my personal favorite has always been Group Chat Lock For WhatsApp. This amazing app, secure user’s private and group chat by simply setting a PIN. Plus, using it user can lock entire WhatsApp with a single PIN. Install today and secure your private and group chats. Make WhatsApp secure! !